Marketing funnel, sales funnel, purchase funnel, AIDA model or customer journey. What these conceptual models all have in common is that they are attempts to map out the cognitive and behavioral process that customers go through when searching for a certain product or service that would fulfill their needs. The theory behind it states that customers go through several stages or phases before making the final call to purchase a company’s product. By mapping out these stages and by stepping into your customer’s shoes, you can see your company from the customer’s point of view and improve where needed. This article will explain a more widely applicable version of the marketing funnel and how to use it yourself. There are many different versions of the Marketing Funnel. I tried to only use very distinctive phases of the customer journey without becoming too specific, in order for this funnel to be applicable for a multitude of industries and businesses. The reason why the Marketing Funnel is a funnel is because the wideness of the funnel at every stage represents the amount of people belonging to it. Since you are likely to loose some potential customers along the way, the funnel gets narrower towards the bottom. Finally it is important to mention that the colours chosen for this marketing funnel are deliberate. In the beginning, your relationship with potential customers are rather ‘cold’ and are therefore coloured blue. Once you get to know your customers, you want to ‘heat’ things up a bit and make your relationship stronger until you reach the advocacy stage (orange). Let’s go through each stage one by one. 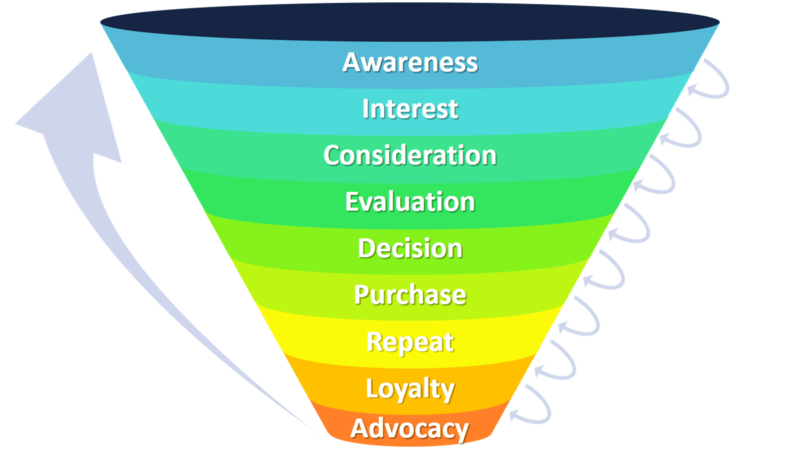 The Marketing Funnel starts off with the Awareness stage (sometimes called Attention). The goal of this stage is to gain presence and to introduce your brand to potential customers: they need to know that you exist. You could either actively reach potential customers through marketing campaigns or help them discover you more easily with their own (online) search. Awareness can be created through advertising, trade shows, direct mail, social media campaigns et cetera. In order for customers to more easily find you online, Search Engine Optimization (SEO) and Search Engine Advertising (SEA) are advised. Now that you have the consumers’ attention, you want to create some interest. The goal of this stage is to show who you are and what your brand stands for. You are trying to build a relationship with your potential customers and gain trust. Give people valuable information, but don’t focus too much on selling your product yet. Throughout this stage potential customers begin to develop attittudes, opinions and hopefully interest in your company. Content creation is often used for this stage. Think about blogs, webinars, infographics, free e-books, newsletters et cetera. Keep in mind that customers can also develop negative feelings towards your brand, so be careful with what kind of messages you convey to potential customers. Once the customers’ interest in your company has grown, they might be willing to consider purchasing your products or serivces as well. In order to establish that, you first have to help them realising that your product is meeting a need or desire that they might have. Furthermore, you have to explain that YOUR product is the best option for meeting that need. This stage is therefore all about positioning and showing off your unique selling points (USPs): what extra value do you have to offer to customers compared to competitors? People usually consider only 3-5 different brands before purchasing one, so you want to make sure your brand is among those. Persuasion skills and a good sales team can be very helpful during this stage. Now that your brand has made it to the Consideration set, customers are likely to evaluate the options based on some personal criteria they might have. Even though selection criteria may vary from person to person, you might be able to find some general patterns by looking at the most often used criteria. Continious customer feedback, surveys and focus groups will help you figuring out what customers in general find most important about a certain product. Once you are aware of these attributes, you could guide your marketing efforts in such a way that you highlight these features when showing off your product. Often used attributes that customers use to evaluate products are: price, quality, appearance, durability and after-sales service. Finally the customer will make a decision to either buy or not buy from you. Important to note here is that the one making the decision does not allows have to be the same person as the one purchasing the product or using the product. Think for example of a child who wants a Nintendo console from the toy store. Even though the child might become the user, it is the father who might decide whether he will get one, whereas the mother might be the one who will have to go to the store and purchase it. It is crucial to keep that in mind when targeting your marketing efforts to certain groups of people. The child for example should be targeted with news about the amazing games you can play on the Nintendo, whereas the father should be informed about the relatively cheap price and the durability of the Nintendo console. The actual purchase phase has been kept separate from the decision making phase because of two reasons. The first one has to do with the difference between the buyer and decision maker as explained above. The other one is because potential customers might still decide to NOT purchase your product even after they decided to actually purchase your product. This could for example happen when a customer is searching online for your webstore and has trouble finding it. Or because they have issues with the payment options on your website’s check-out page. Once your prospects have decided that they want your product, it is up to you to make it as easy as possible for them to make the purchase. In case of a webstore, try to get rid of unnecessary and distracting features and make the path to the check-out page as clear and simple as possible. This will help you to boost the conversion rate. Many marketing funnels stop after the purchase has been made. However, in the hypercompetitive and dynamic environment of today, it is key to keep customers with you for as long as possible. Repeat purchases and the retention of customers are therefore just as important as the initial purchase. Good after-sales service and customer relationship management (CRM) enlarge the chance that customers will become repeat customers. You could for example start by sending out an email a week after the purchase has been made asking for customer feedback. People generally love to give their opinion on subjects. From there on you can get to know the customer better and see if he or she might be interested in a repeat purchase. Depending on the nature of your business, calling or even meeting up face-to-face with customers are considered more personal and more effective. This latter is for example more appropriate in the auto or consulting industry where larger transactions are being made. In the loyalty stage, customers start to develop a preference for your brand or company. They do not make repeat purchases anymore because you remind them of it, but because they genuinely like your product. Customer loyalty is therefore far more favorable than repeat purchasing. Loyalty means customers are hanging in there even when there may be some problems or negative rumours about your company. In order to create loyalty, your customers need to see the relationship between you and them as more than just a transactional relationship: connecting with your customers on a personal level is therefore crucial. Strong engagement, personalization, loyalty programs, community development, social identity and the sharing of values can help with that. The final and optimal stage to reach with customers is the Advocacy stage. Advocacy happens when your customers become something more than just customers: they become fans. Fans are usually so excited about something that they tell their friends and family all about it, they share positive reviews on social media, and they might even try to convince others to become fans as well. In other words, they are now helping you creating awareness just like at the beginning of this marketing funnel. When customers decide to become your own brand’s ambassadors, you know you are doing something right! The marketing funnel is a great tool that helps visualizing the customer journey or the path that prospects take as they become more familiar with your company and products, from awareness to purchase to (hopefully) the advocacy stage. 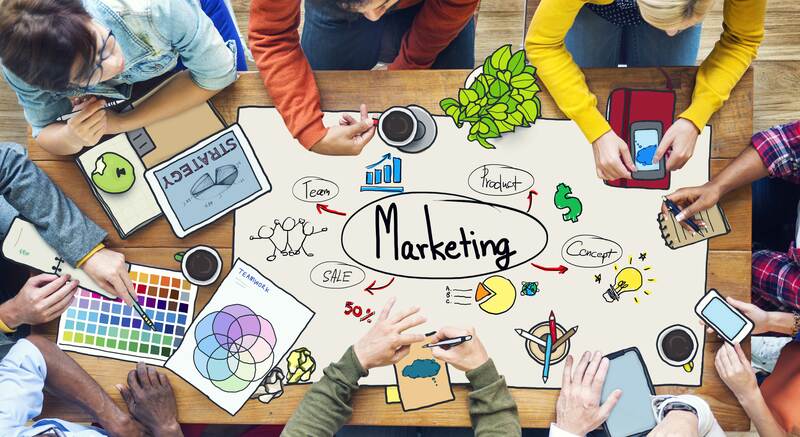 It allows marketeers to map out the marketing campaigns that need to be considered in a more structural approach. Keep in mind that this is a general version of the marketing funnel and that you might need to adapt it somewhat to fit the business you are in. Let the marketing begin!